Slice the zucchini & eggplant in thin slices about 1/6 of an inch. Place flower in a large bowl and season with salt & pepper. Make a well in the center and add the soda water. Whisk until smooth. Place all sliced zucchini & eggplant into the mix and blend well with your hands making sure you don't break the slices. Soak for 15-20 minutes. In a large, heavy bottomed pot, heat about 4 inches olive oil until just before the smoke point. 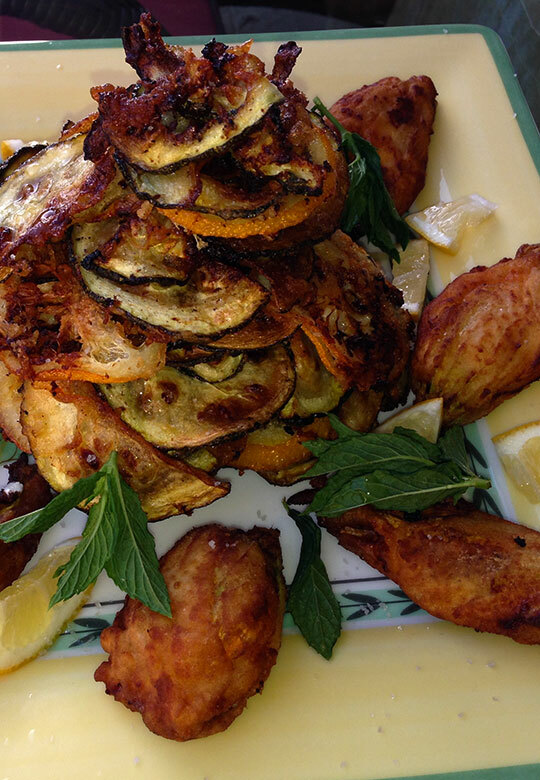 Gently drop the zucchini & eggplant slices in the hot oil, making sure they don't adhere to each other. Fry until golden brown and crisp. Remove with a slotted spoon or spider and drain on paper towels. Serve hot on plate with lemon and fresh mint.